I choosed this book for it’s compelling title. Although I initially thought that it would be more oriented to show you how to improve your creative skills, it actually guides you to Zen Buddhism through Art. And it’s very good at it. 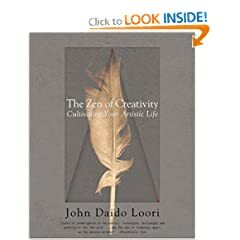 Written on a autobiographical way, John explains the basic principles of Zen and how your own artistic and self-expression search can lead you to the discover of the truths of life. Goes between the practice, with even some exercises, to the basics of zazen and the Zen principles, a description of the Zen Arts and the Zen aesthetic.